Professor Marco Chiarini, who died during last November, has left four works to the Uffizi Galleries. These are a painting for the Palatine Gallery, and three works on paper: one will become part of the collection of the Gallery of Modern Art in Palazzo Pitti, the other two will go to the Department of Prints and Drawings of the Uffizi. Chiarini was an art historian devoted to original and significant researches. Under his direction - lasting about 30 years - the Palatine Gallery in Palazzo Pitti and the Boboli Gardens have started to be known and loved internationally. In his will, Chiarini established these artistic legacies, his last gift to the city of Florence and the art world. A Landscape with shepherds by the French painter Claude Lorrain will arrive to the Palatine Gallery of the Pitti Palace; while the Portrait of Piero Chiarini, a drawing by Adriano Cecioni - signed and dated 1882 - will go to the Gallery of Modern Art. 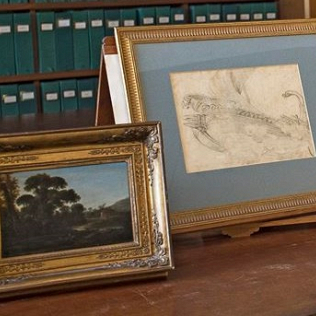 Two other drawings will arrive to the Department of the Uffizi: a Galera, a drawing attributed to Pietro da Cortona - artist of the seventeenth century - and a depiction of Santo Stefano Rotondo and aqueduct of Nero of Rome, by Alessio de Marchis - a Neapolitan artist from the eighteenth century.